I was living on Park Lake, just outside of Lansing, Michigan. The summer of 2009 was a difficult one for me. My father had died only a few months before. I felt the loss deeply. During that summer, there two days in which the sunsets on the lake were vibrant to the point of being nearly unbelievable. The evening sky was painted with saturated hues of crimson, orange, and purple. I decided to take my photography equipment down to the lake and immerse myself in color—for color was something my father would have very much appreciated. Loading my gear into the kayak and towing it behind me by a small rope, I waded into the mud of the lake. Slowly and carefully, in order to avoid slipping and falling into the water, I made my way out from shore. Step by cautious step I worked around the cattail forest hugging the shore, aiming for the relatively shallow sandy underwater ridges that lay beyond them. Adjacent to one of those ridges was an area populated by reeds. Several drooped in graceful arcs, a shape I found to be calming and beautiful. I set my tripod up in the water. Only the very top of it protruded from the lake. On that I placed my camera. When everything was said and done, my camera was only about four inches above the water. Shooting this low offered me an intimate perspective of the reeds. Using the widest aperture on my lens, the background was transformed to a soft colorful blur. I focused on one of two reeds. 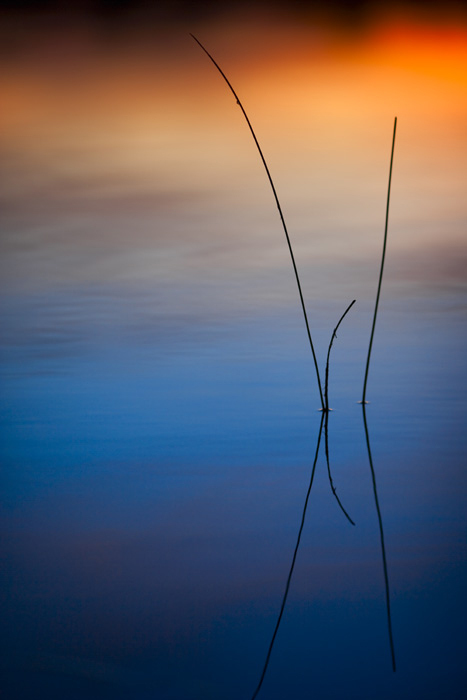 The resulting photography was Haiku Reeds. It is still one of my favorites. In terms of composition, I love its simplicity. In addition, I very much enjoy its qualities of form, line, color and graphic design. For me it is a Zen-like image that speaks to beauty. It refers to the interior stillness within each of us—a reservoir of strength upon which we can draw in times of need.